If you are not sure which network configuration you should use, then please read the Setup Options section below which explains the different setup options. 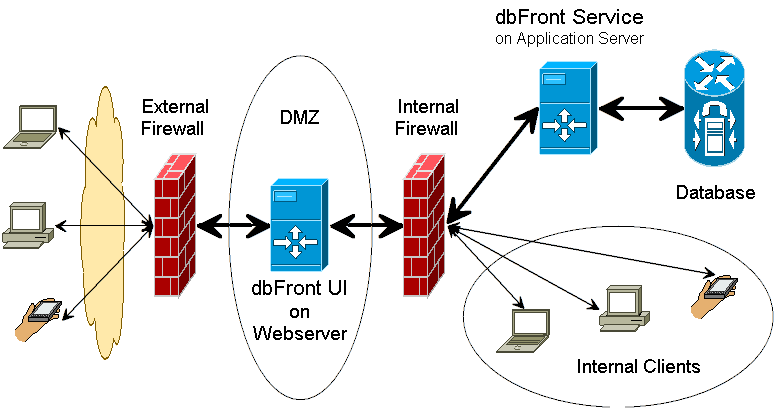 The dbFront installer will install both the Web Application and the Service correctly. If you installed both on the same server then you can skip to step 3 where you setup the database connections. If you chose a manual installation, or if your situation is more complex then you can review the settings in steps 1 and 2. There is a wide variety of network setup options available. The following two sections will compare two of the main options but the installation can usually be tailored to suit your network needs. dbFront can be run entirely from a single server. This server could even be the database server. But just because it can be done does not mean that it should be done. The database and the application loads are small. A single server to install, maintain and backup. Potentially fast if the server is not overloaded because the only network traffic is between the server and the client since all other traffic between the database, application server, and web server are internal. Difficult to properly secure. Should NOT be exposed to the web or only via VPN access. A single and much easier target for an attacker to compromise. The server load will be too high for larger or high load databases. The optimal setup is to spread the Database, Application Server and Web Application over three servers. The Database and Application Servers should be installed inside your internal network. The Web Application server should be installed in a DMZ. A DMZ is a special protected network zone created for web servers that sits between your internal network which is usually considered the safe zone and the fully exposed internet. Web servers in the DMZ are partially exposed to the internet so that users on the internet can access them but this access is limited to make it difficult for attackers to abuse these servers. Most robust setup since there are three servers that share the workload. Most secure setup since an attacker would have to compromise multiple servers before they could get into the network. Most complex setup. Need to configure and manage the interaction between multiple servers and firewalls. Highest potential latency because a full request to the database will involve multiple network hops as the request passes between the various firewalls and servers back to the client browser. Once the layout of the infrastructure has been decided then the next step would be to setup the webserver and install the dbFront UI.